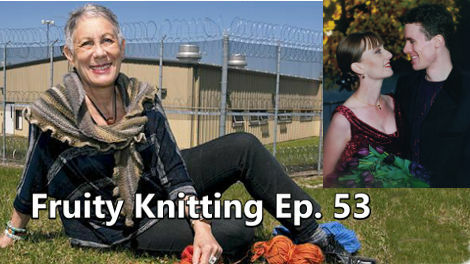 Knitting Behind Bars is a program for teaching prison inmates to knit. In our interview in Episode 53 with the program’s creator, Lynn Zwerling, we’ll hear about why she started the program, the challenges she faced, and what she has learnt from the experience. Lynn is an unassuming woman but what she has achieved is truly inspiring. New Releases features designer Mary Annarella and her design, Rocket’s Cardigan of the Galaxy. It’s a beautiful design, just right for the season and comes with a great back-story. Andrea has a quick tutorial looking at cabling and twisted stitches, and to celebrate our 20th Wedding Anniversary we give you a little look at our wedding day in Melbourne. Knitting Behind Bars is the program set up by our interview guest Lynn Zwerling, and we’re celebrating our 20th wedding anniversary. 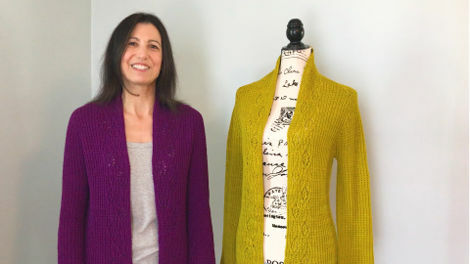 Lynn Zwerling was a latecomer to knitting, learning the skill shortly before her retirement. 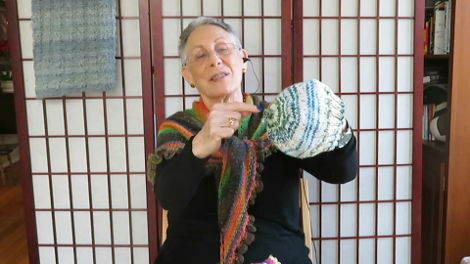 Lynn found that knitting made her calm and helped her focus. As part of her “retirement plan”, Lynn decided to introduce knitting to a population that would also benefit from the practice. She created Knitting Behind Bars to give inmates at her local prison the opportunity to learn a new craft, work on worthwhile projects, and to gain access to the focus and calm that she herself had gained through knitting. Lynn showing one of the hats knitted by an inmate through the Knitting Behind Bars program. Lynn had the formidable task of first convincing the wardens and then the inmates to accept and acknowledge the benefits of the program. 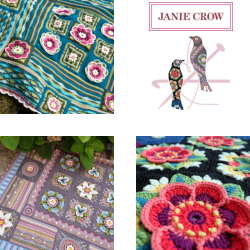 For over 10 years now Lynn has committed herself to go every week into the prison and has taught over 600 men, not only to knit but also to find some inner calm and well being. This is a touching story of persistence and growth. If you would like to contact Lynn, it is best to contact her via the Facebook page. Mary’s son is probably responsible for Mary’s latest creative output. After watching the action flick ‘Guardians of the Galaxy’ with him and loving the amazing 70s soundtrack, Mary was inspired to create ‘Cardigans of the Galaxy’. 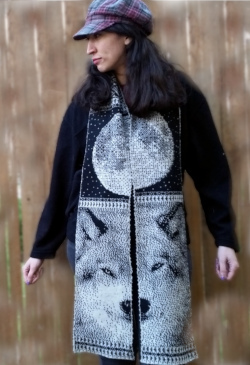 Rocket is a genetically modified Raccoon and his cardigan design has elegant paw prints (lace and cables) running up the back of the cardigan on a background of a broken rib pattern. Rocket does have a chip on his shoulder so the broken rib also symbolizes his broken personality. Despite being inspired by a raccoon, Mary’s design is amazing elegant and the pattern is both charted and written out, so you can use the type of directions you prefer. 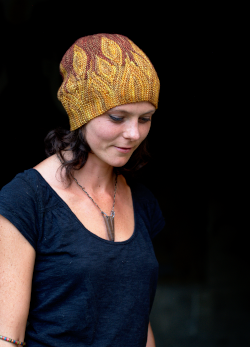 Mary has a lot of other gorgeous patterns in her Ravelry store for you to check out as well. 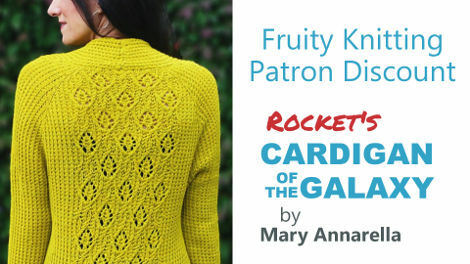 Mary is offering Fruity Knitting Patrons a discount on the pattern for Rocket’s Cardigan of the Galaxy. You can find full details on the Patreon post. 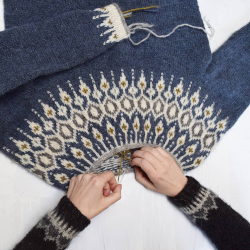 The body and arms of the Zweig pattern by Caitlin Hunter has a delicate all over stitch pattern that looks like diagonal crosses. They are made by combining a two stitch cable that leans to the left with a two stitch cable that leans to the right, and then the reverse is done above that. Since the cable is only worked with two stitches, the structure is the same as twisted stitches or crosses stitches. 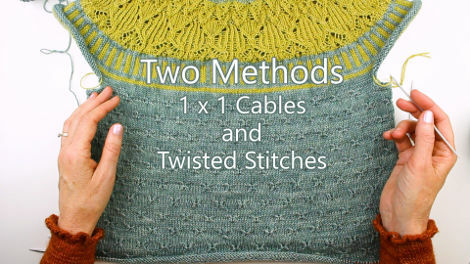 Therefore you can do this stitch pattern in a few different ways. In the tutorial I show you two ways. 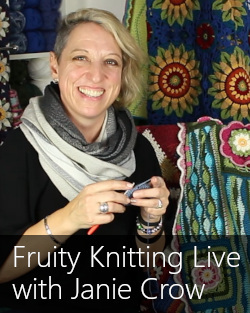 All Fruity Knitting Tutorials are cataloged for the convenience of our Patrons at patreon.com/fruityknitting/posts?tag=Tutorial. 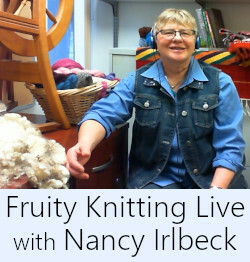 Fruity Knitting Live is a monthly online video event, featuring one of our recent interview guests. Shetland Patrons can join the event online, and get to speak to our guests directly. Merino Patrons can submit questions and topics for discussion. Afterwards we release a special audio podcast, available for our Merino Patrons and any Shetlands who were not able to attend the event live. This is a really exciting opportunity to speak to and ask questions of our guests directly. 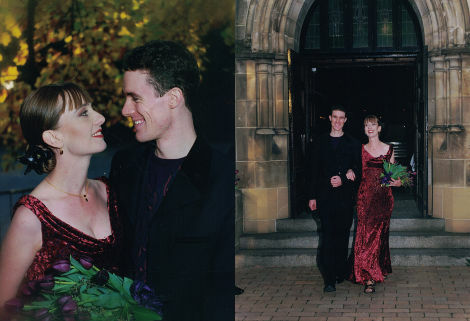 Our wedding, at Trinity College Chapel, Melbourne University. We have taken the old dusty video of our wedding out of the cupboard and managed to get it on digital technology so that we can show you a snippet or two. We really feel old when we look back at the quality of the video. (Andrea, you don’t feel one bit old, I can assure you. ed.) It’s not like the professional movie trailer wedding films you see nowadays. We did have stunning live music right throughout the ceremony and we danced the Tango at our reception, which we thought you might enjoy! We are essentially on holiday during this episode, so there isn’t a lot of knitting content from us. We have gone to the German spa town of Baden Baden which is south of Frankfurt in Baden Württemberg. 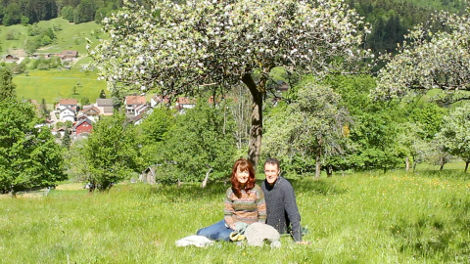 We’re sitting here in a lovely apple orchard to record and struggling a bit with the wind. Andrew’s vest is also serving as a wind shield for the microphone. 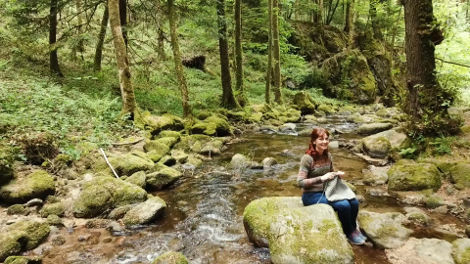 Extreme Knitting – Just downstream of the Geroldsauer Falls, near Baden Baden. Andrew is wearing St Brigid by Alice Starmore. Andrea is wearing Samphrey by Marie Wallin. In the interview with Lynn Zwerling, Andrea is wearing the Manzanita Tee by Romi Hill. Congratulations on your wedding anniversary. It is heartwarming to watch you together. I watched most of the podcasts and pretty quickly concluded yours was superior. Thank you for the interview in Ep.53. My eyes were welling too. Your content is always interesting with amazing production values. Your program is one I knew I wanted to support. By the way, the music you choose is always so uplifting. Thank you. This episode touched my heart in so many ways. I taught Meditation and Yoga in the Federal prison system. The inmates were kind, thoughtful, and protected me more fiercely than the guards. They said that it was the only time each week that they felt like humans. As I heard their stories, I often thought, “There for the Grace of God go I.” My heart and hat go to Lynn for her years of dedication. So. Much. Love. in this episode. And I lif a glass of wine, toasting your next 20 years of sharing the Journey! Thanks, Patty, for your lovely comments and your good work.